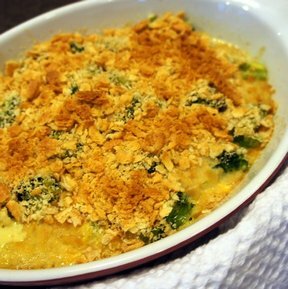 Cheese and broccoli baked together and topped with a crispy topping. Its the perfect side dish for any meal. Who doesn't love cheese and broccoli? 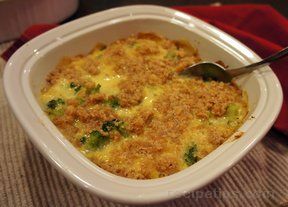 Season broccoli and add to cheese mixture. Pour into a pan. 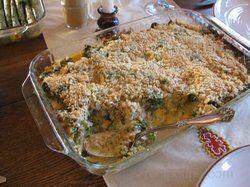 Top with crushed crackers. Bake 20-25 minutes at 350 degrees F.
"Not my favorite but the kids seemed to like it. 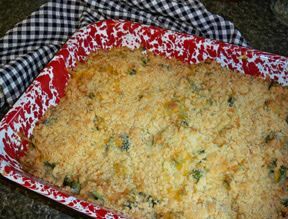 I did cover it since the topping was getting too brown before the rest of the meal was done, and that made the crackers get a little soggy."